North Carolina’s largest school system will join a growing list of districts closing their doors this month in anticipation of a massive teacher rally in Raleigh. 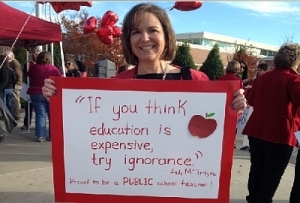 Officials with the Wake County Public School System announced their plans Monday, as teachers plans their protests to coincide with the May 16 return of state legislators to session. Wake schools weren’t the only ones to announce their decision Monday. Guilford County Schools reportedly will close as well, with thousands of Guilford teachers requesting off May 16. Mooresville Graded School District announced its plans to close Monday too. State lawmakers have been under fire from public school advocates and educators in recent years. In part, the criticism stems from lagging teacher pay, although state lawmakers have approved modest raises in recent years. Still, North Carolina’s overall K-12 funding from 2008 to 2015 was down more than 12 percent when inflation was taken into account, one of the largest declines in the nation, according to a report last year from the nonpartisan Center on Budget and Policy Priorities. School advocates say they’re expecting more than 10,000 teachers to converge on Raleigh for this month’s rally, which is led by the state and local chapters of the N.C. Association of Educators. The interest’s spurred Charlotte-Mecklenburg Schools—the state’s second-largest district—to close too, along with Durham Public Schools and Chapel Hill-Carrboro City Schools. If districts don’t close, teachers must request a personal day, requiring them to forfeit $50 from their paychecks. The North Carolina rally follows widespread teacher protests in generally conservative-leaning states like Oklahoma, West Virginia, Kentucky and Arizona. Look for more coverage of the May 16 rally this week at Policy Watch.